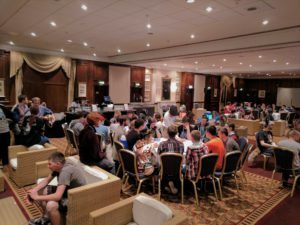 For anyone who hasn’t been to ConFuzzled before, they shouldn’t leave without coming to some of our events. Across four (and a bit) days of frenetic activity, we aim to bring something for everyone, whether you fancy catching one of our fabulous shows (daaaahling!) or listening to some of our distinguished guests. Check out our humble YouTube page for more of our past recordings! 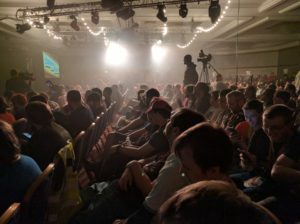 Alternatively, if big stage events are not your thing, we would love to see you at one of our many and varied panel events. Whether it is meeting up with likeminded furries at a social, learning about better fursuiting techniques or even inspiring your own artistic endeavours! 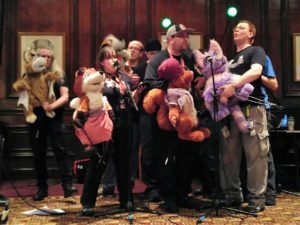 If you are looking for music, ConFuzzled run many DJ sets to party along to, and if you are really brave, look out for the Karaoke session!